Ladakh provides many different opportunities to enjoy the outdoors. We can organise treks to suit your interests and requirements. Whether it's wildlife, scenery or monasteries, let us know what you want to see and we'll explain the different possibilities to you. 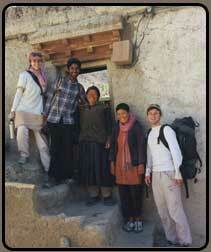 All of our treks are homestay treks. Click here to see our recommendations on things to bring with you as well as information about altitude sickness, drinking water and cultural considerations. More information on the Ladakhi weather and trekking season is available here. Likir to Ang and Temisgang. This is a good introduction to trekking in Ladakh and good acclimatisation if you want to attempt longer, more difficult treks. A leisurely trek through a number of picturesque villages, starting with a visit to Likir monastery. This trek is not just about the great scenery, but also gives you the chance to learn about Ladakhi culture and experience village life along the way. Depending on the itinerary you choose, you may also have time to visit the new monastery near Temisgang, as well as Lamayuru or Rhizong monasteries and Alchi monastery on the final day before returning to Leh. 3 nights/4 days (or shorter or longer). All year round. Likir to Ang via Saspoche and Uley. This is for experienced trekkers as there are no proper trails to follow on the first 2 days when you will visit less-visited villages. As with our easier Sham trek, you will have the chance to learn about Ladakhi culture and experience village life along the way, as well as enjoying the great scenery. 3-4 nights/4-5 days. All year round. Start with the picturesque villages and culture of the easy/moderate Likir to Ang trek and then head for the high mountain pass of Tar La(4970m), finishing the trek with a visit to Lamayuru monastery. 6 nights/7 days. Beginning July to mid-September. This is a harder trek than Markha Valley, but you are rewarded with amazing views over Sham to the north, Zanskar to the south and Stok to the east. Start with the easy crossing of Prinkita La pass(3730m), followed by the more challenging passes of Konzke La(4950m) and finally Stakspi La(5290m). Enjoy a wide variety of flora along the way, as well as wildlife. See unusual carved wooden statues in Sumda-Chenmo, visit the monastery in Sumda-Choon. 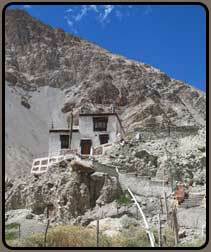 End the trek with an optional overnight stay near Alchi and visit famous Alchi Monastery the next day. 5-6 nights/6-7 days. Beginning July to 1st week September. Combine the picturesque villages and culture of the easy/moderate Likir to Ang trek with the challenge of crossing 3 high passes - Tar La(4970m), Konzke La(4950m) and Stakspi La(5290m). End the trek with an optional overnight stay near Alchi and visit famous Alchi Monastery the next day. 8 nights/9 days or 9 nights/10 days. Beginning July to first week September. This is for those who are not sure about trekking at higher altitude. By staying in Rumback you have the opportunity to trek up towards Stok La pass(4850m) and/or Ganda La pass(4850m) - turn around whenever you feel like it or keep going to the top of the pass. Maybe chill out at the tea tent in Rumback while enjoying the mountain scenery. You will see flora and fauna such as blue sheep, marmots and a variety of birds. 2-3 nights/3-4 days or longer. 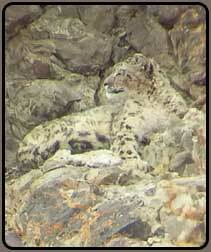 All year round - Jan-Mar for snow leopard trek. Optional acclimatisation day in Rumbak with the opportunity to trek up towards Stok La pass(4850m). You will see flora and fauna such as blue sheep, marmots and a variety of birds. Cross Ganda La pass(4850m) and enjoy wonderful views of the mountain ranges of Ladakh and Zanskar. 2-3 nights/3-4 days. April to October (sometimes also in winter). This is a good trek to choose if you would like the challenge of crossing a high pass, but are short of time and well acclimatised. Optional acclimatisation day in Rumbak with the opportunity to trek up towards Ganda La pass(4850m). You will see flora and fauna such as blue sheep, marmots and a variety of birds. Cross Stok La pass(4850m) and enjoy wonderful views of the mountain ranges of Ladakh. 1-2 nights/2-3 days. Last week May to first week October. A shorter version of the full Markha Valley Trek for those who would like to see Markha Valley, but either don't have the time for the full trek, or prefer a slower ascent to altitude by avoiding Ganda La (4850m) pass. 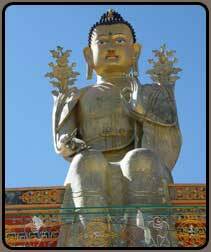 Possible visit to Hemis monastery on the last day depending on choice of itinerary. 1 night in a tented camp. 4-6 nights/5-7 days. Last week May to first week October. Spend a week or more in Hemis National Park. You will see flora and fauna such as blue sheep and a variety of birds. Cross two high passes, Ganda La(4850m) and Gongmaru La(5260m), and enjoy wonderful views of the mountain ranges of Ladakh and Zanskar. Spend a night in a tent at Nimaling and see the sun setting over the Kangyatse peaks. Visit small monasteries along the way. Possible visit to Hemis monastery on the last day depending on choice of itinerary. 1 night in a tented camp. Faster: 6-7 nights/7-8 days, slower (includes acclimatisation day): 7-8 nights/8-9 days. Last week May to first week October. 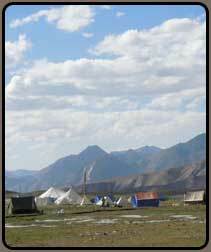 Combine the villages and culture of the Sham trek with the challenge of crossing high mountain passes. Follow the Likir to Ang route described above, then cross to the other side of the Indus and ascend to the pretty village of Hinju, passing through the village of Tar and crossing Tar La(4970m) from where you can enjoy magnificent views of the Ladakh range and Sham villages. From Hinju there is a steep climb to Konzke La(4950m) before descending to Sumdah-Chenmo where you can see unusual carved wooden statues. The last day is the hardest with 2 passes to cross to reach Chilling, but you are rewarded with fantastic views from Pagal La(4210m) and Dundunchen La(4620m). 7 nights/8 days. Beginning July to mid-September. This is our longest homestay trek and is a great way to combine the villages and culture of the Sham trek with the challenge of crossing high mountain passes , finishing with Markha Valley and Gongmaru La(5250m). The trek starts with the above Likir to Chilling route and then follows the Chilling to Shang Sumdo route. 12-13 nights/13-14 days. Beginning July to mid-September. This trek follows the Lamayuru to Alchi route as far as Sumdah-Chenmo. The last day from Sumdah-Chenmo to Chilling is the hardest with 2 passes to cross, but you are rewarded with fantastic views from Pagal La(4210m) and Dundunchen La(4620m). 4 nights/5 days. Last week May to first week October. Start the trek following the Lamayuru to Chilling route, and then Jingchen to Chilling in reverse. 8 nights/9 days. Last week May to first week October. This trek crosses 4 passes over 4,600m. It follows the Lamayuru to Chilling route, then continues with the Chilling to Stok route. 8 nights/9 days. Last week May to first week October. The trek follows the Lamayuru to Chilling route and then continues up Markha Valley following the Chilling to Shang Sumdo route. 9-10 nights/10-11 days. Last week May to first week October. Based at a homestay, you will search for signs of snow leopards during the day and experience Ladakhi hospitality in the evenings. The best time to visit is during the mating season in January to March. We offer two different experiences, one based in the Sham area (rated moderate) and one based in Rumback in Hemis National Park (rated moderate/difficult). There are several monastery festivals during January to March, so why not time your snow leopard experience to coincide with a monastery festival as well. Please contact us for further details. January to March.